It was an amazing week and I will definitely go again. 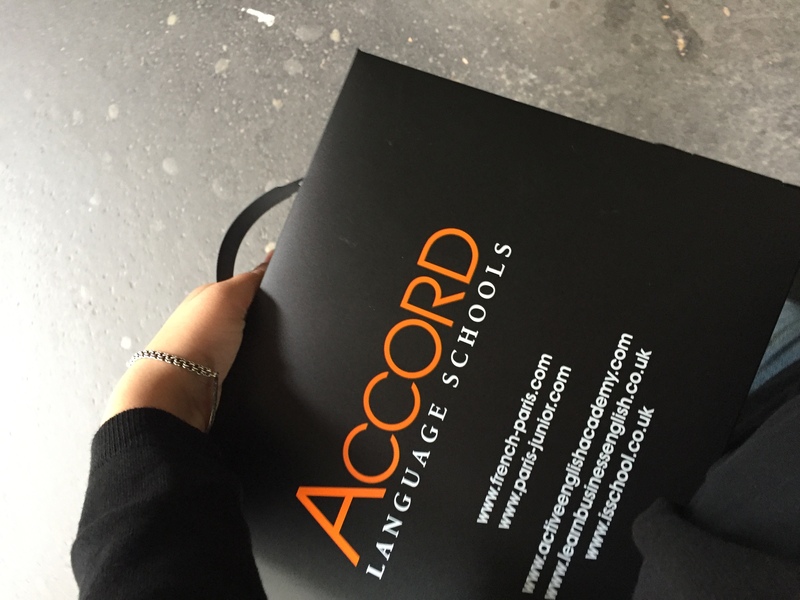 ACCORD Paris - school on the Grand Boulevard with a large selection of French courses. ACCORD Paris is located on the famous Grand Boulevard just a few minutes walk from the Louvre, Opera Garnier, the Center Georges Pompidou and the famous Galeries Lafayette. This is a typical Parisian part of the city, where there are many cafes, restaurants and shops. Relax with a cup of hot chocolate in one of these cafes, watching the flow of life in Paris. The French language school ACCORD Paris offers a wide range of high-quality courses that are held throughout the year in a beautiful typically Parisian building in the heart of the city. At the service of students 20 bright, spacious and fully equipped classrooms. ACCORD Paris built its reputation based on the development of a modern and dynamic teaching method, which is based on communication and integration into French culture. The school offers at least 8 language levels from the very beginning to the advanced. Semi Intensive General French course focuses on developing the four communication skills: listening, speaking, reading and writing and includes 20 lessons a week. Semi Intensive General French is designed to develop all kinds of language skills. Students will replenish their vocabulary, strengthen grammar, improve written French, strengthen reading skills. With this course, you can quickly speak French and use the language in everyday communication situations. Intensive General French courses focus on developing the four communication skills: listening, speaking, reading and writing. There are morning courses available as well as more intensive programmes including specific afternoon workshops to match each student’s specific requirements: French Culture & Civilisation, Business French, Grammar, Exam preparation etc. Business French lessons simulate realistic business situations such as presentations, meetings and negotiations so you can get all the practice you need. Interactive and engaging lessons where you can build your business vocabulary and fluency in realistic situations, carefully designed to give you the confidence needed in today's fast-growing and ever changing business life. You will interact with other students from around the globe, delivering your opinions spontaneously and negotiating solutions confidently. French and Law Programme: focuses on the French legal terminology, the French and European legal systems. Includes lectures from visiting legal experts and visits to legal institutions. - A course specially designed based on the student's abilities and needs. - A specialised French course: business, finance, medicine, law, science, etc. - Schedules and timetables are arranged prior to the student's arrival. The general French course is designed to develop all kinds of language skills. Students will replenish their vocabulary, strengthen grammar, improve written French, strengthen reading skills. With this course, you can quickly speak French and use the language in everyday communication situations. Our homestays and host families have been carefully chosen by ACCORD and are located in Paris. They are used to welcoming students and know how to help them familiarize themselves with the French way of life and culture. The following options are available: single room, twin room, bed & breakfast, half-board (breakfast and dinner) and breakfast & kitchen access. The half-board option is ideal for practicing French outside the classroom. The C.I.S.P Residences are located in Southern Paris with single rooms and breakfast or half-board. The value for money facilities include a self-service restaurant, cafeteria, TV room, self-service launderette and car park. This residence is located at Porte d’Italie close to the Parc Kellermann in a lively area of Paris just a few metro stops from the Beaubourg and the Latin Quarter. Subway Station: Porte d’Italie (N° 7). The quality of teaching in small groups allowed for great progress. All the teachers were fantastic. Ask for details about the afternoon workshops before making a choice. It was an amazing week and I will definitely go again.